The original date of 20th April has been postponed as there wasn’t nearly enough people for the event. Saturday July 7th is the new date. With about 8 months left before Jill heads to Russia for her life changing Multiple Sclerosis treatment, she is still £15,000 short and won’t be treated if she can’t raise that extra £15,000! We have been working hard to arrange a Fire Walk & everything has now been finalized. The lovely people at Tobacco Factory stepped in to offer their brilliant venue. 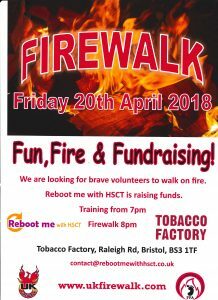 On Saturday July 7th 2018 Jill will be hosting her very own Fire Walk at the Tobacco Factory in Bristol and is looking for 100 volunteers to take part in this fun, adventurous, exciting, heated fundraising challenge. The team at UKFirewalk.com talked us through what would happen, offering lots of support & training on the night. The task is simple, walk over a bed of hot coals. We’re looking for 100 people to raise £150 each from sponsorship (excluding £15 deposit). This will ensure Jill reaches the remaining £15,000 target. Fancy watching it? Please come down & support the Walkers! 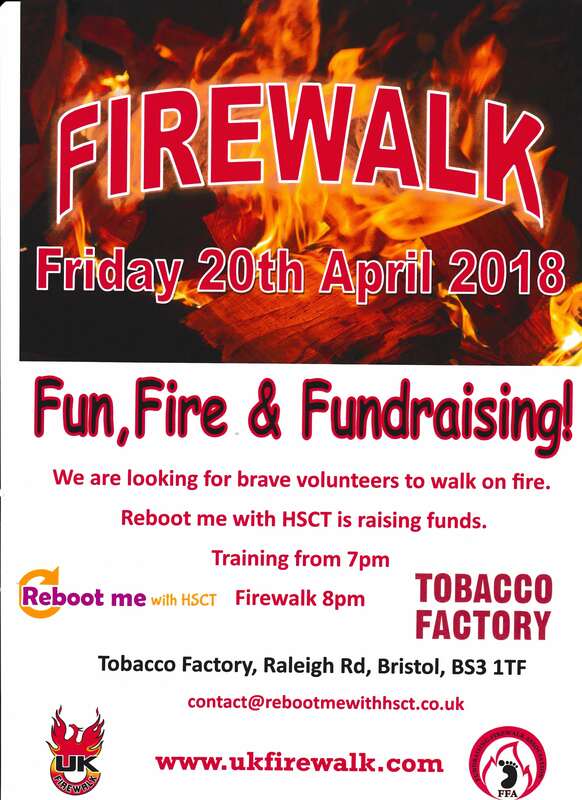 the Fire Walk training will start at 7 pm, the Walk will begin at 8 pm sharp. Please do tell everyone, and share this event. Lets get people talking about this!! If you are interested in taking part we will require a deposit of £15 to secure your place. To pay the deposit, please send £15.00 to us via PayPal using this PayPal link , alternatively you can pay via bank transfer (contact us for details). This must be paid before the event – we cannot accept cash deposits on the night. Whilst paying via PayPal – Please include your name & email on the notes section. You can download the sponsorship form here. Before the night – Please download and bring Registration Form. Just a quick one! the Reboot Me With HSCT team has taken over the @ShiftMS Twitter account for this weekend until 9am Monday Morning. So feel free to get in touch with us and join the conversation! Now I knew of HSCT as something new and exciting in the MS world but what I didn’t know was how good it was and how achievable it was to get. Joining all the HSCT groups I could asking all the questions I could researching. I thought to myself, no I won’t be able to have this, no one will say yes to me. I saw that ordinary people with MS just like me were standing up and saying hold on this isn’t a cure but its near as close to it and I want a piece of that pie, and I thought yes me too I want my life back. I’ve forgotten what it was like to be normal, having a night out with my friends and not cancelling at the last minute because I wasn’t well enough. I want to see and do things like everyone else.